On February 23rd; Bellator returns to the emerald green isle of Ireland for Bellator Dublin. Bellator seeks to bring with it, a night in which sheer, un-adulterated, unfiltered, rawesome, intense chaos is almost guaranteed to ensue. The card is relatively stacked, if you’re into your Irish or British MMA, you’ll recognize some top prospects like ‘SBG Charlestown’ captain Peter Queally & other fan favorites like Kiefer ‘Big Daddy’ Crosbie taking to the stage. Personalities like John Kavanagh have even went so far as to claim it’s could be the biggest night in Irish MMA since Conor McGregor obliterated Diego Brandao back in 2014 at the point arena. But… What If you’re just a regular old ‘Filthy’ casual ? What about this card will get your juice flowing ? Why should you spend your Saturday night watching some Irish MMA card ? Well the answer is simple. Let me break it down in four easy points. Since getting finished and embarrassed by Ricky Bandejas in August; Gallagher has been glued to the gym. He’s been stuck on a constant quest of improvement and betterment and at Bellator Dublin, he seeks to right the wrongs of the Bandejas loss. Even though Gallagher looked lackluster in his last bout; he’s still a Jiu Jitsu Brown Belt with tremendous hype behind him. It’s more than possible that he will go on to do tremendous things in Martial Arts. He’s only 22 years old and has plenty of time left to improve recover the damage done by the Bandejas loss. You only have to look at legends like Anderson Silva, Jose Aldo, Conor McGregor & Cris Cyborg who had embarrassing career beginnings yet managed to rebound from early losses. 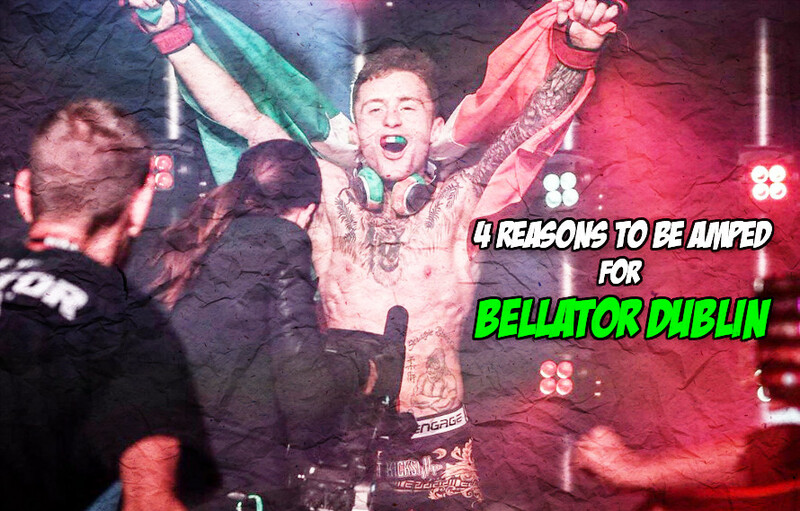 At Bellator Dublin, ‘The Strabanimal’ is offered a true chance at redemption, and it’s fascinating to ponder where he goes from here. There’s a monstrous beef currently going on in Irish MMA community; involving the ‘Previously Mentioned’ Peter Queally & Myles Price. The beef all traces back when Myles Price; left SBG to train at rival Irish MMA Gym Team Ryano. At Team Ryano Price was critical of SBGs team mentality and training methods. After establishing camp at Team Ryano for a while, Price was drafted into Khabib Nurmagomedovs training camp at California’s American Kickboxing Academy, to help ‘The Eagle’ prepare for his UFC 229 clash against McGregor. The move from Ireland to AKA caused an almighty uproar in the Irish MMA Community; with Price swiftly being branded as a ‘rat’ or ‘traitor’. Since being labelled a traitor; Price has responded by embracing the tag-line in a T.J Dillashaw ‘Snake in the grass’ like fashion. With Queally being the SBG captain, he vows to bring revenge in what is set to be a violent clash of martial arts. Everyone loves a comeback, right ? Well at Bellator Dublin; team SBG is offered a golden chance at revival. Recently the gym has underwent some heavy scrutiny from the MMA world due to a few of their high profile athletes like Conor McGregor, Artem Lobov & James Gallagher experiencing devastating losses. This Bellator event gives them a stepping stone to rebuild some momentum by picking up a few wins against the competition. A few wins could start a moral resurgence within the team and perhaps set them on a path for win-streaks in 2019. The card also features some great SBG prospects like Sam Slater who’s only (2-0) as a professional; yet looks unstoppable when locked in a cage. There’s also the precariously mentioned Kiefer Crosbie who is reminiscent of Justin Gaethje in his stand and bang fighting style. There’s a few other fights sprinkled in the crevices too like Sinead Kavanaghs comeback fight and Charlie Ward is threw on there too.